Dogs are an important part of our lives and we often consider them members of our family. We love them so much, we may even like them better than the important humans in our lives like family members or significant others. As pet parents, we like to spend as much time as possible with our furry friends and integrate them into our daily routines. They come with us to the park, the hardware store even our friends houses. They do things with us we know they shouldn’t like sleep in our beds and even eat food from our plate. Pets are as human to us as our siblings, children and friends. Our pets aren’t just a part of our lives, they are also an important part of our family’s lives. Our family probably loves our dogs as much as we do and even consider them part of the family. Have you ever suspected your mom might like your dog better than you or even better than your significant other? Well you aren’t alone. Over one quarter of pet parents have a strong suspicion their family likes their pet better than their significant other. So now your spouse has to compete with your dog? It’s definitely easier to love a cute dog than the person dating your child or sibling. Some pet owners even place dogs at the top of their list of important relationships so much so that they may dump their significant other if their dog doesn’t like them, or there is conflict with a friend or a person that they are dating with their dog. 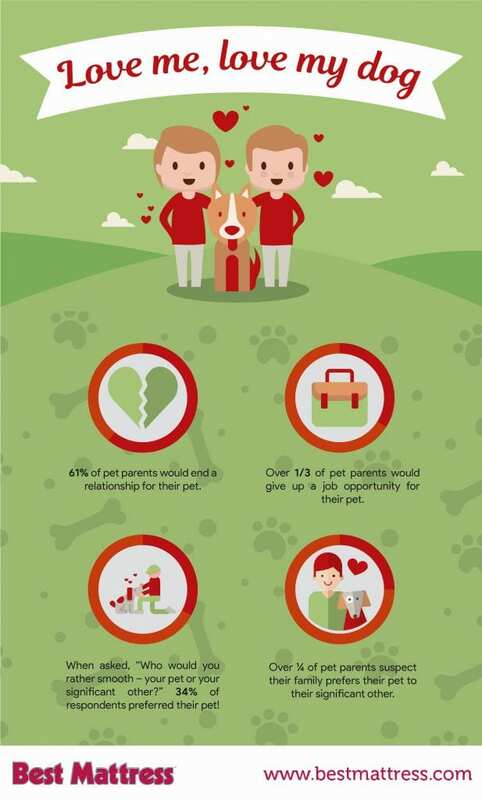 In a survey, 61 percent of pet owners said they would end a relationship for their pet. So it’s not just your family you need to worry about liking your S.O., your dog also has to be on board. Our loveable kanine’s also tend to get a lot of our attention. When asked, “who would you rather soothe, your pet or your significant other?” 34 percent of dog parents answered the question with the fact that they’d rather “soothe” their dog! Who wouldn’t want to cuddle their adorable puppy as much as possible? Even some of the biggest decisions in life are affected by our dogs, including where we live and where we work. Dogs affect many areas of our lives from school to where we live to where we choose to take a job. If any of these things don’t make room for our beloved pets, we may pass them by. Some opportunities may not be worth sacrificing mans best friend. When asked if pet owners would pass up a job opportunity for their dog, over one third of pet parents said yes. Whats higher priority than that?